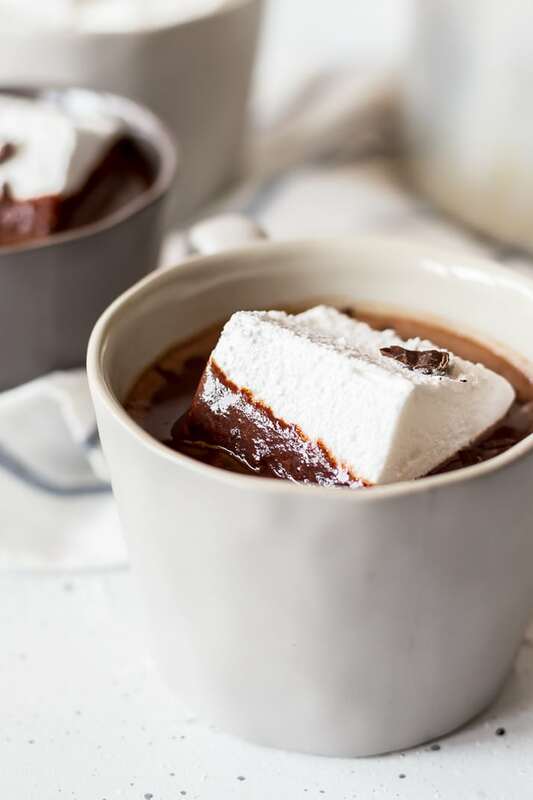 Homemade Marshmallows are the perfect way to dress up rich hot chocolate during the winter months. Package them up as gifts, or dip them in caramel and chocolate at the fondue bar! Matt did! I know, crazy right!? I may have tricked him into it because I was running short on time prepping Thanksgiving goodies, so I asked him to watch Alton Brown’s video tutorial and make them. Matt loves Alton Brown and learning techniques from him. We used Alton Brown’s recipe for this first go round, but I can’t wait to make more with different flavors! Even though Matt was the one who made them, we were both pretty surprised at how easy they were to make. The majority of the time was taken up by the whipping and setting of the marshmallow cream. 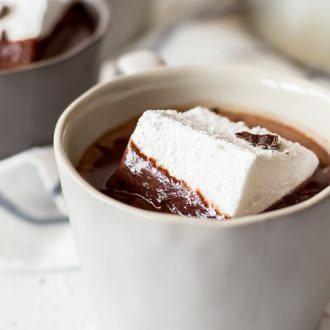 I loved how they melted and made a creamy topping on my hot cocoa, they were great on my sweet potatoes and delicious enough to just eat plain! These would make a great addition to a food gift basket, or whip them up for a hot chocolate bar on Christmas Eve! Combine the gelatin and 1/2 water into the bowl of a stand mixer and let set. Combine remaining 1/2 cup water, sugar, corn syrup, and salt in a small sauce pan. Place over Medium-High heat, cover and cook for 3 to 4 minutes. Uncover and clip a candy thermometer to the side of the pan a continue to cook until temp reaches 240 F. Should take about 7 to 8 minutes. Once the mixture reaches this temperature, immediately remove from heat. Turn the mixer on low speed, while running, slowly pour sugar mixture down the side of the bowl into the gelatin mixture. Once you have added all the sugar syrup, turn speed to high and whip until the mixture becomes very thick and lukewarm, about 15 minutes. Add vanilla during the last minute of whipping. Combine confectioner’s sugar and corn starch together in a medium bowl. Lightly spray a 9 x 13 baking pan with cooking spray and dust with the confectioner’s sugar mixture. 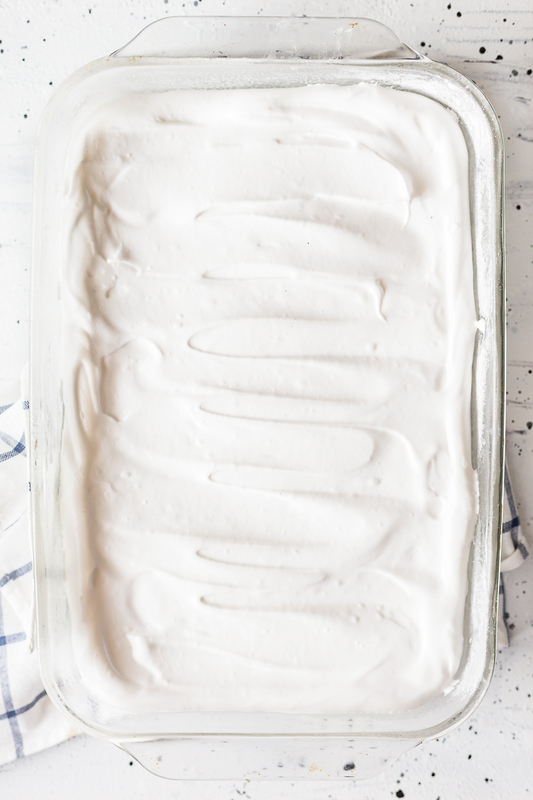 Spread marshmallow cream out in the pan so it’s relatively level. Sprinkle with more confectioner’s sugar mixture. Let sit uncovered for at least 4 hours, preferably overnight. Once set, turn marshmallow out onto a cutting board and slice into 1 in. squares with a pizza cutter dusted in confectioner’s sugar mixture. 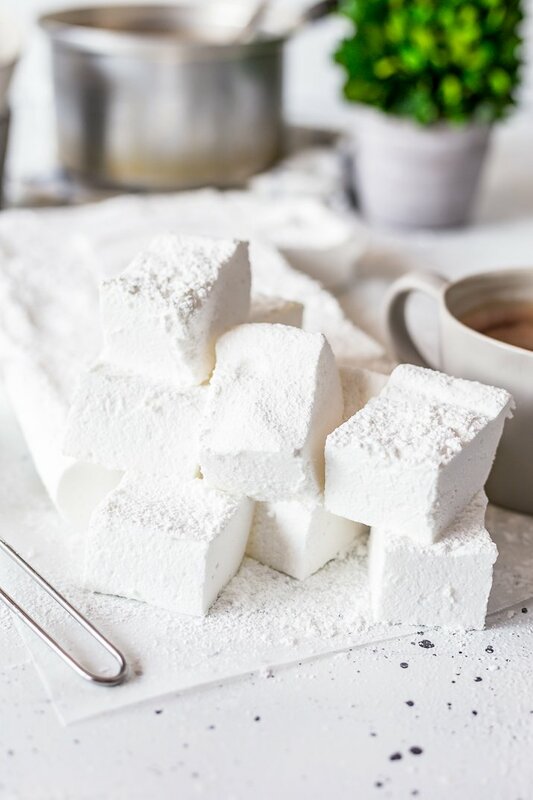 Once cut, dust every side of each marshmallow with confectioner’s sugar mixture, make more mixture if needed. Store in an air tight container for up to 3 weeks! This post was originally published on December 3, 2017, photos and content were updated September 8, 2017. I love this recipe! So easy! I just made them with chocolate chips for a backyard cookout with the Youth Group. They should make amazing s’mores! Thanks a bunch!! Chocolate Chips!? That’s a genius addition! I am so glad you enjoyed them and I hope you make some wonderful memories with them! We make a few of his recipes regularly, the man sure knows his stuff!